Back to 1980. Gosh, over 20 years. Well The 70's with all these rock and punk bands were over. A brand new generation of Hard Rockers was waiting there to conquer the world and particularly in the UK because almost everything started from there, with the famous New Wave Of British Heavy Metal (NWOBHM). Saxon started in 1979 with a boogie-rock album and supported Motörhead on their Bomber-Tour in 1979. It is kind of funny that both bands were headliners in Wacken 2001 on the same stage. Wheels Of Steel was the real start of a band's career which should have been (for me) much more glorious than it was and is now. Influenced by Motörhead and older bands, Saxon just let their good old blues influences aside and let it all go with some pure heavy rock songs. The influence of Judas Priest (the denim and leather look) and Motörhead. The song See The Light Shining is dedicated to Mr. Fast Eddie Clarke, Motörhead's guitarist by these great times, and on the booklet's picture you can see 2 Motörhead T-shirts and legendary bullet-belts. Lemmy is still wearing them. A new generation of rockers influenced by motorcycles (Motorcycle Man, Wheels Of Steel and Freeway Mad) and biker outfit was born. The title Stand Up And Be Counted (which intro by the way sounds a little like No Class from Motörhead) shows another attitude, rougher and harder than the earlier generations of the 60's and 70's. About the songs : they are all great metal songs and the ballad Suzie Hold On is one of my favorite song ever (hey! 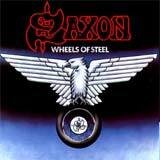 I discovered Saxon with this album ;-) ). There is nothing to say about the legendary neckbreakers 747 (Strangers In The Night) and of course Wheels Of Steel except that they've scored both on the Top 20. It is a great album for sure. Biff's voice fits perfectly with the band's style. The production is maybe a bit crapy and I hope Wheels Of Steel will be remastered one of these days because it's worth it. So this will be 95 points just because of the production.